Unfinished school assignment (c.1900) by W.A. Dwiggins. Image courtesy of The Newberry Library. 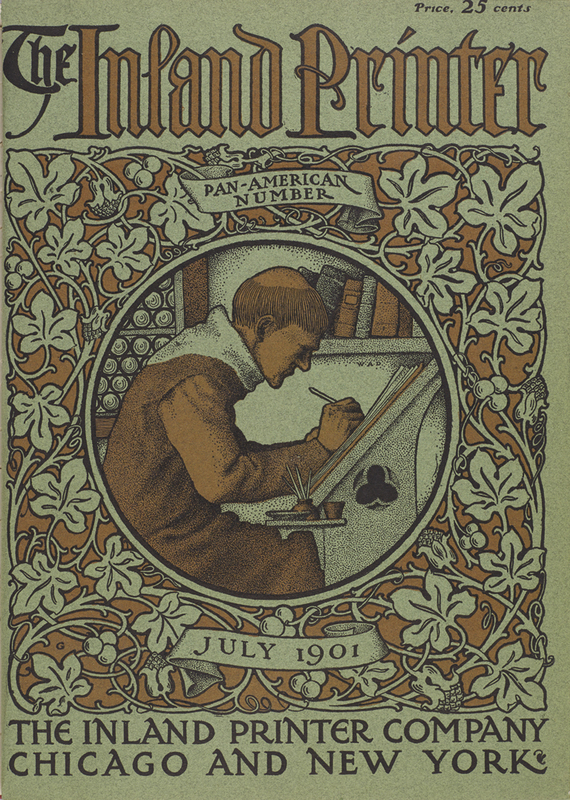 Cover of The Inland Printer (July 1901). Illustration by W.A. Dwiggins; lettering and ornament by Frederic W. Goudy. A different iteration of the scribal monk, done entirely in line, was created by Dwiggins sometime after his move to Hingham, Massachusetts in 1904. It became his first professional mark, used on bookplates and stationery until the fall of 1908. The bookplate version seems to be the earliest instance of it. The scribal monk, facing left, is seated at a different sloped writing desk with an open window in the background. There are no books or rolled-up scrolls in the room. The drawing is more medieval in character than the earlier illustration. 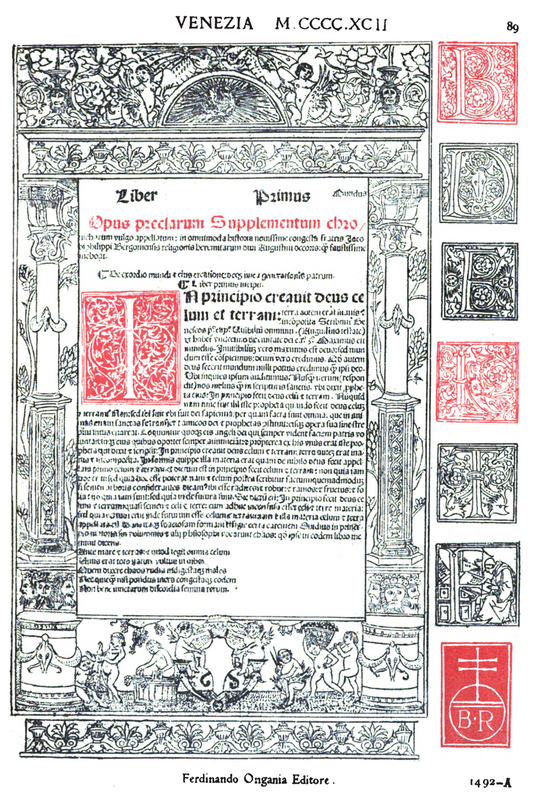 The bookplate has “WILL · DWIGGINS · HINGHAM · CENTRE · MASS.” running around the illustration in classical Roman capitals. It is printed in black on colored paper. Copies on lavender, lemon yellow, rose, and light brown paper are known. This second scribal monk also appears on what is either another bookplate or a business card. “WILL DWIGGINS / TYPOGRAPHIC / DESIGN · LETTER / ING · HINGHAM / CENTRE · MASS ·” in justified lines of classical Roman capitals appears below the image. Bookplate (c.1906). Design, illustration and lettering by W.A. Dwiggins. Formerly in the personal collection of Irving Oaklander. Business card (c. 1906). 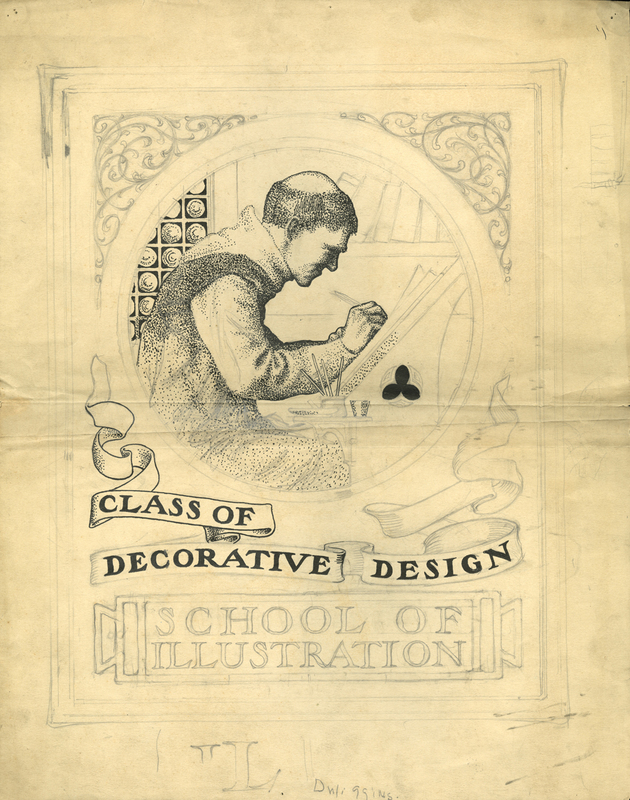 Design, illustration, and lettering by W.A. Dwiggins. Page 89 from Early Venetian Printing Illustrated (Venice: Ferd. Ongania, London: John C. Nimmo, and New York: Charles Scribner’s Sons, 1895). The initial E at lower right was the model for the scribal monk designed by W.A. Dwiggins c.1906. 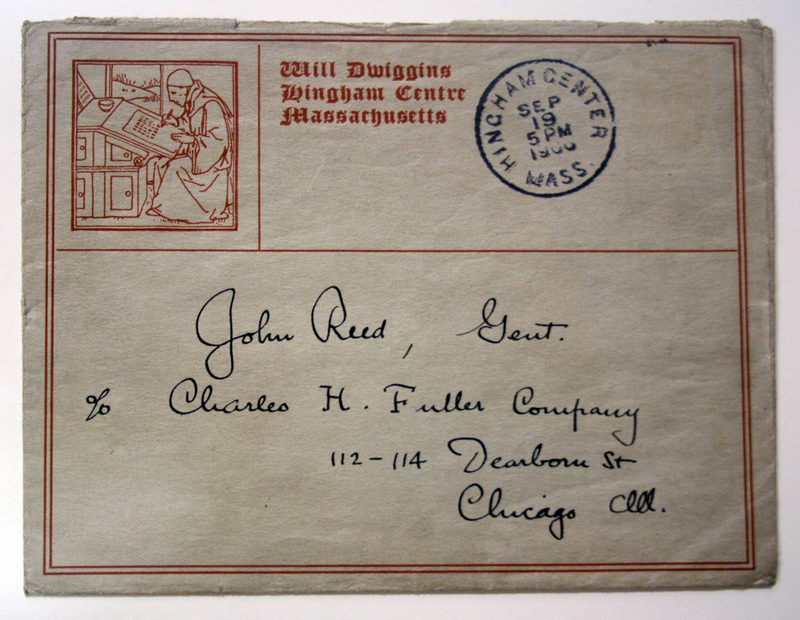 The scribal monk illustration was also used by Dwiggins on an envelope and a letterhead. Two versions of the latter exist. In the first it is centered below “Hingham Centre, Massachusetts” lettered in a chancery italic with Roman capitals and a long s in the manner of Griffo’s typeface; and in another, it in the second it is centered below “WILLIAM A. DWIGGINS · DESIGNER / BOOK DECORATION / LETTERING” in classical Roman capitals. The latter was designed in November 1907. Envelope (1906). Design by W.A. Dwiggins. W.A. 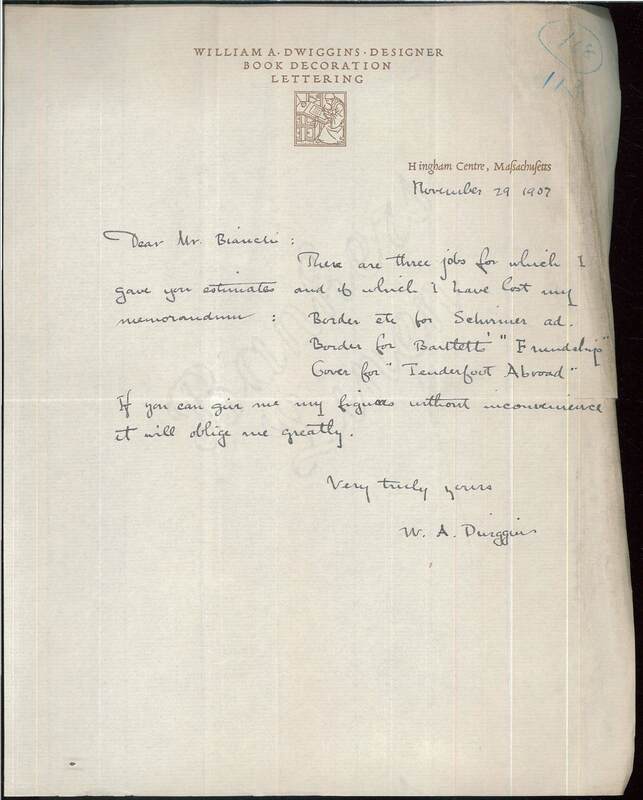 Dwiggins to D.B. Updike 20 May 1907. Image courtesy of The Huntington Library. W.A. Dwiggins to D.B. Updike 29 November 1907. Image courtesy of the Huntington Library. In November 1908 Dwiggins replaced the scribal monk with the “digger” (a man with a spade) as his professional mark. The shift from the scribe to the digger was significant. It signified his shift from an Arts & Crafts aesthetic to a broader one that encompassed printed work from the Renaissance to the Enlightenment, influenced by his work with Updike at The Merrymount Press. 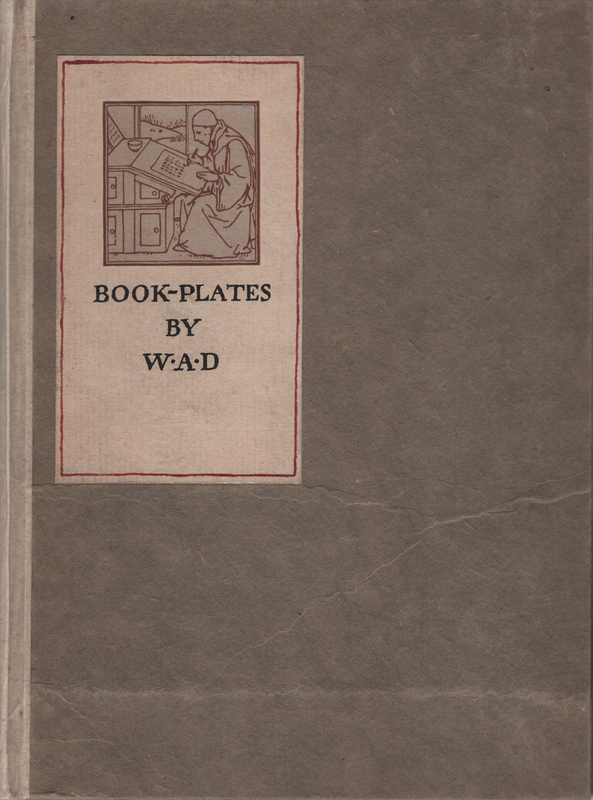 Cover of Book-Plates by W.A.D. (c.1906). Illustration by W.A. Dwiggins. 1. The Inland Printer vol. XXVII, no. 4 (July 1901) includes the first public notice of Dwiggins’ work. 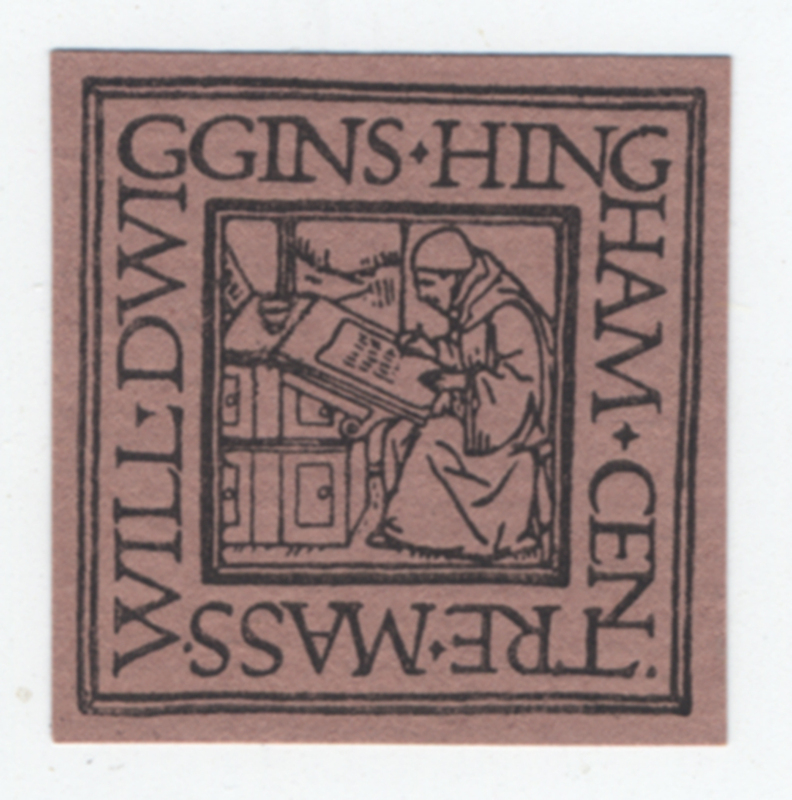 See p. 596 where two bookplates of his are reproduced alongside a miniature version of the cover design with Goudy. Goudy was responsible for the lettering and decorative border on the cover (signed G.). 2. For Kalman’s design of the Barnes & Noble shopping bags see his obituary by Steven Heller in The New York Times, 5 May 1999. 3. I refer to a compound letter because Reed and Dwiggins wrote back and forth to each other between October 20 and November 14, 1906, commenting on each other’s writings and adding pages to a single document as they went along. See Folder 2, Dwiggins Ephemera (Wing MS 12), Newberry Library. The WD mark mentioned is not the W within a D that Dwiggins used—along with others—during his years in Chicago. (E.g. 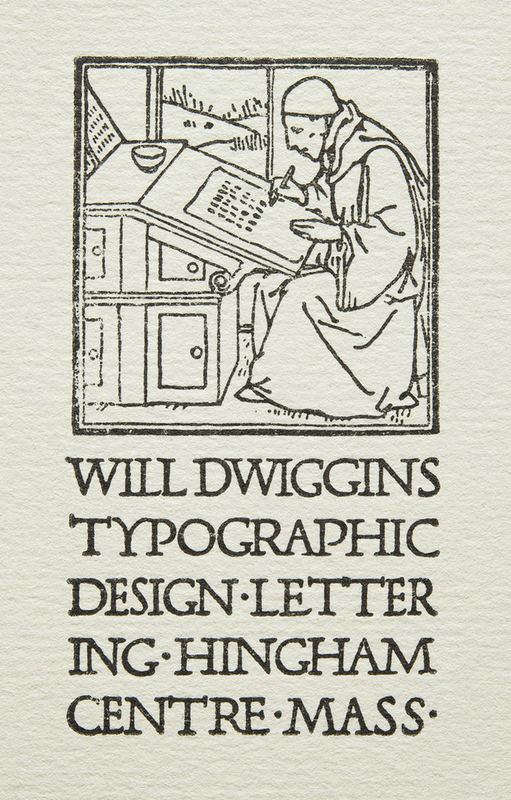 in his woodcut portrait of William Morris in The Definitive Dwiggins no. 198.) Instead it refers to a mark based on traditional orb-and-cross printer marks such as that of Nicolas Jenson. The only instance of it in use by Dwiggins that I have seen is on a mailing label in the W.A. Dwiggins Ephemera Collection, Wing Collection, Newberry Library. 4. Updike’s copy of Early Venetian Printing Illustrated is now part of the Updike Collection on the History of Printing in Special Collections, Providence Public Library (call number Pq655.1453)53aE). An initial P with another scribal monk on p. 101 may also have influenced Dwiggins. Both it and the initial E was subsequently reproduced in Early Woodcut Initials by Oscar Jennings (London: Methuen and Co., 1908), pp. 182–183. But by then Dwiggins had ceased to use the scribal monk as a professional mark. 5. W.A. Dwiggins to Frederic W. Goudy 7 February 1908 in Folder 35, Box 12, 2001 W.A. Dwiggins Collection, Boston Public Library. Although Dwiggins promised Goudy he would use blank stationery upon his return from Europe, there is one instance where he used the scribal monk letterhead. See W.A. 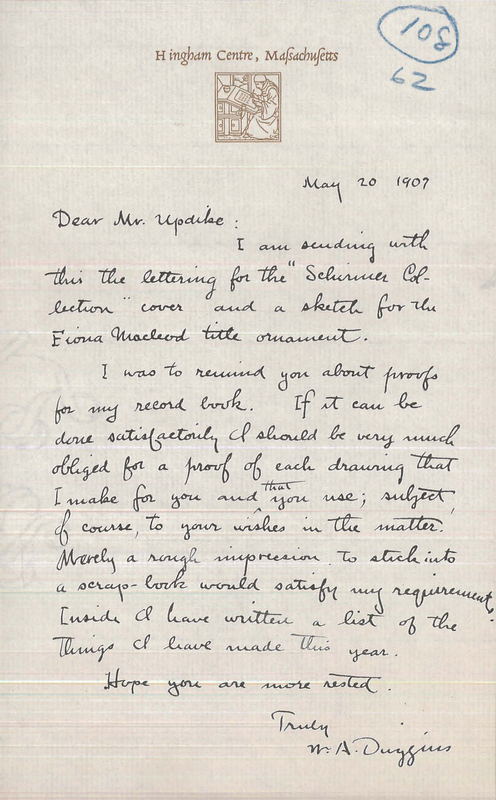 Dwiggins to Daniel Berkeley Updike 7 September 1908, Letter 108:199, Box 69, The Merrymount Press Collection, The Huntington Library. Dwiggins did not open a studio in Boston until early 1910. 6. The first use of the digger was for a Christmas card that Dwiggins planned to sell. See W.A. Dwiggins to Daniel Berkeley Updike 12 November 1908, Letter 108:237, Box 69, The Merrymount Press Collection, The Huntington Library. The history of Dwiggins’ digger mark will be the subject of The Definitive Dwiggins no. 163. 7. The bookplate album is in Folder 8A, Box 34, 1974 W.A. Dwiggins Collection, Boston Public Library.